PDF Reports Splitter (A-PDF Content Splitter) is the ideal PDF split tool for you to split PDF report by text content in specified position. You can quickly split multiple pages PDF to individual PDF files in a few steps, by specified rules you have decided. You can custom split rules by Invoice, Order ID and Phone number and so on. Not need to split PDF file into individual PDF manually in a long time, just choose PDF Report Splitter. This is the best PDF split solution. Some of our PDF need to split by the specified word/text/position. For example, a PDF is integrated with all your invoice record. You need to extract and distribute each of the invoices to your clients, but you have no idea about how to split the multiple pages PDF, then you can use PDF Report Splitter software to add split tag to define rules, and then create all invoices from the larger PDF. If you need to split PDF in a more complex condition, for example, extract PDF page by invoice and order ID and more, you can easily make it come true if using PDF Reports Splitter, just add more split tags to set the split rules. Expect for split tag, you can also add macro tag. Split tag can be used to trigger to split file and can be used in output name and properties. However, the macro tag is used to output name and properties only. 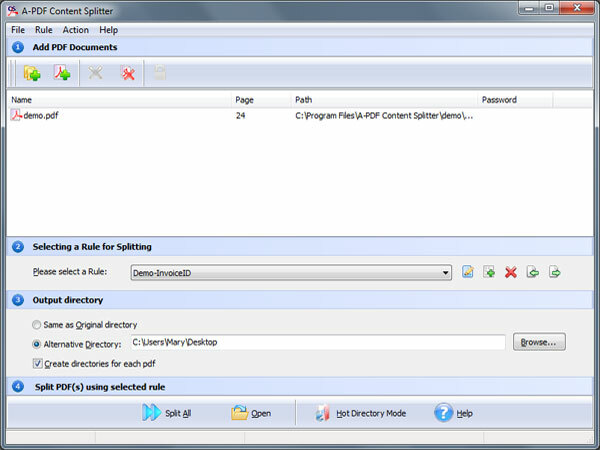 PDF Reports Splitter is simple to use desktop application. You can not only run on the software to split PDF, but also automatically executed by command line. All functions can be work by writing command line code.